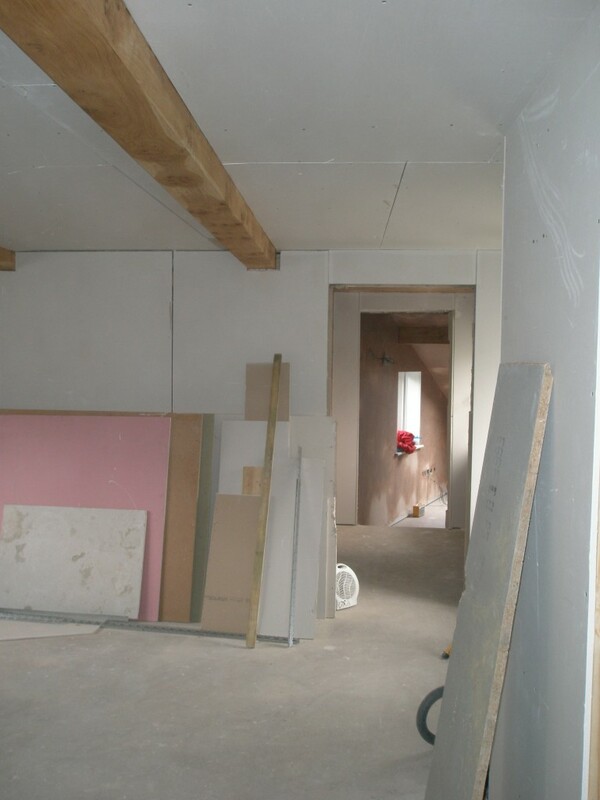 In the last week, we have completely plastered two of the rooms on the first floor. 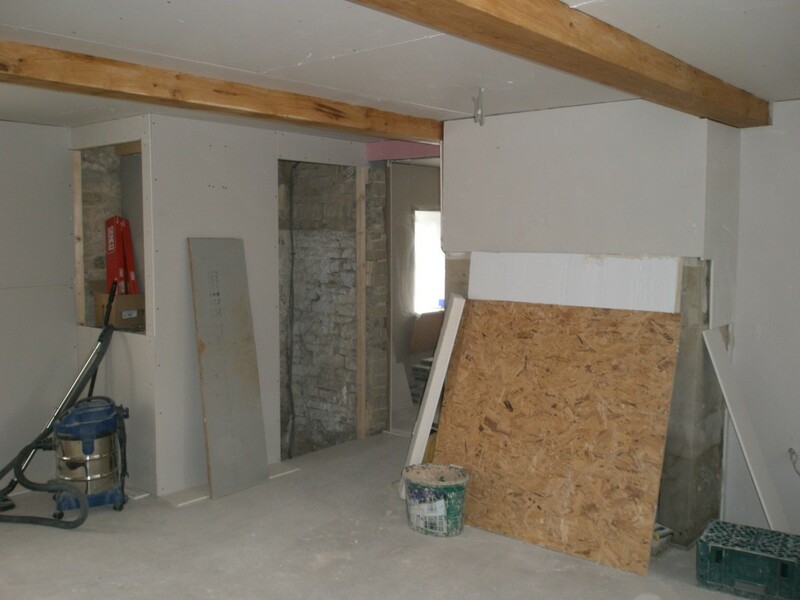 In addition, we have boarded out most of the downstairs ready to plaster. 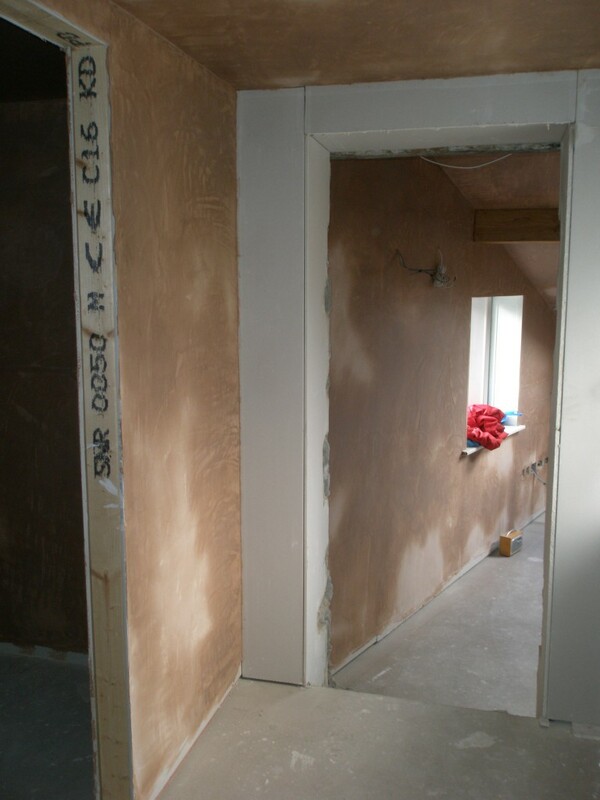 At the weekend, we made a start on plastering my study and the adjoining cloakroom. It will take 3-4 days before the plaster is dry enough to paint. But the rooms are already transformed. This room is a really odd shape, but it all adds to the character of the property. I am so glad that we increased the size of the windows in here as well as swapping the original steel beam for an oak one! It is going to take 3-4 days for the plaster to dry. The door on the left is to a WC next to the study. This has been completely plastered. This is the downstairs bedroom in the existing cottages. We will plaster around the fireplace. We have boarded around the cellar steps and created a cupboard for the lighting computer (just above the vacuum cleaner). 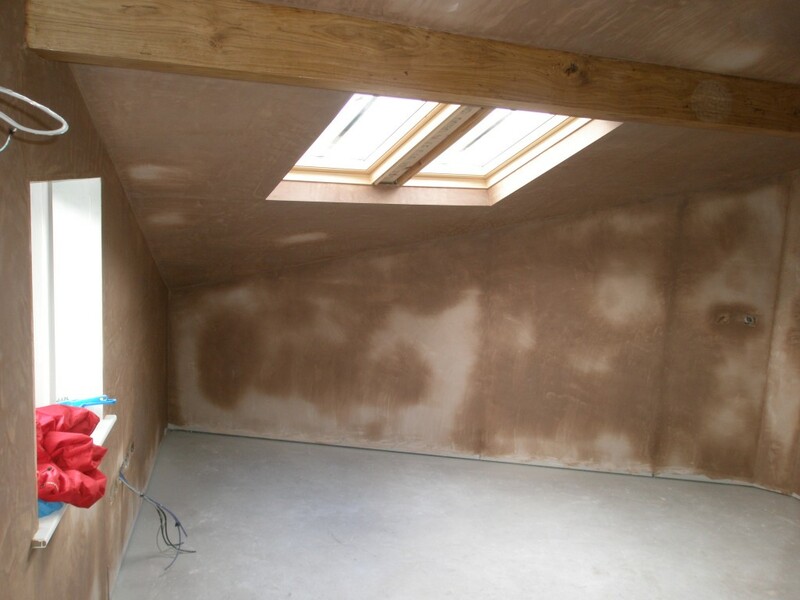 The downstairs bedroom has been boarded out and will be plastered next. You can see to my study beyond. We have had some bad weather this weekend. While the study in the rebuilt lean-to was being plastered, it became apparent that there is a problem with the flashing. This is where the top of the roof meets the wall to the main building. This needs to be looked at quickly. While my study was being plastered this weekend, it became obvious that there was a problem with the flashing on the roof. 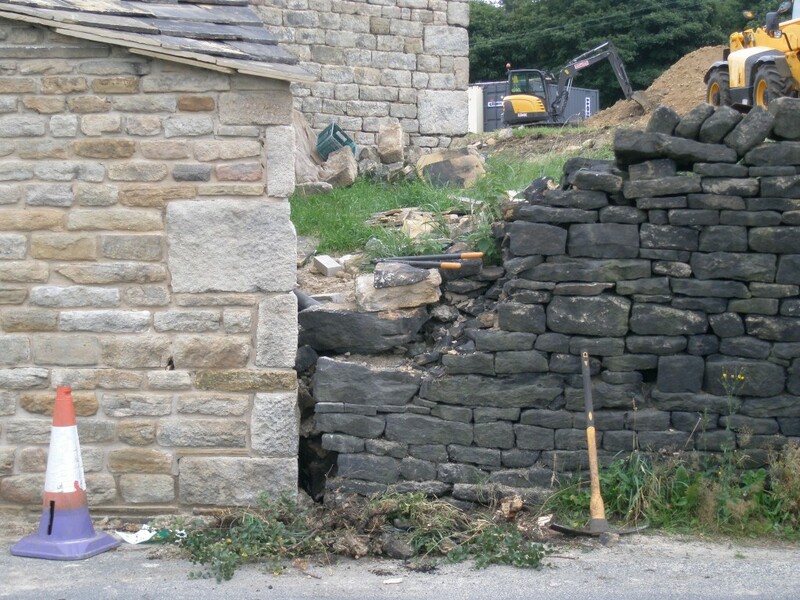 Part of the dry stone wall adjoining the newly rebuilt extension had to be dismantled while it was being rebuilt. However, now the building work is complete we can repair the wall. It also makes the site a little more secure since it was relatively easy to get through the wall from the road side. 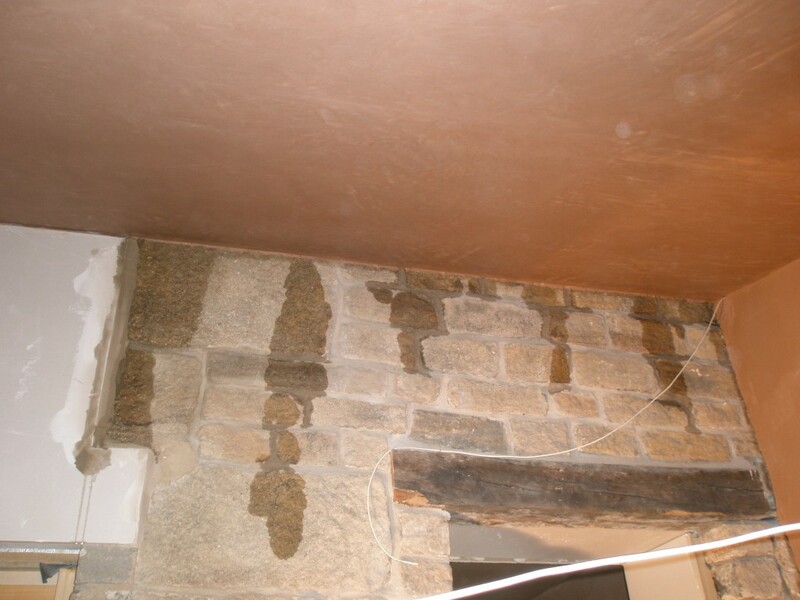 I have run a piece of damp course down the wall where the dry stone wall meets the building. I have only run this above the level of the damp course in the building. 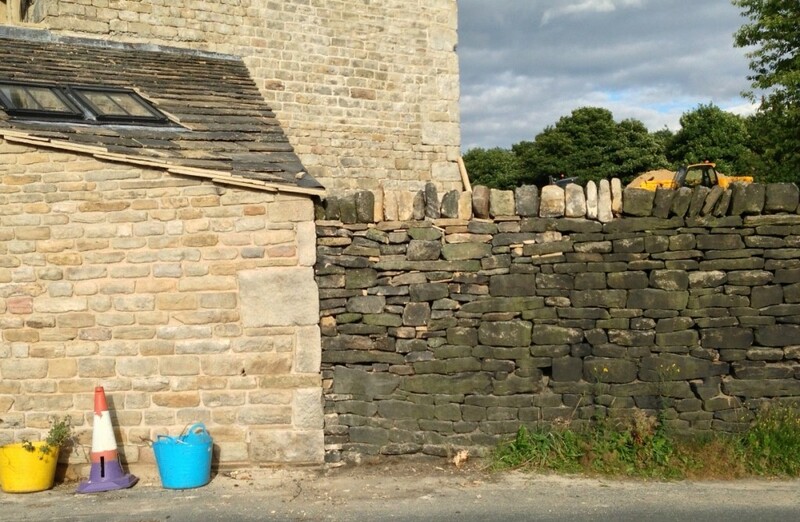 This should help prevent any damp transferring from the dry stone wall to the building above the internal damp course level. I have tried to use black faced stones wherever I can so that the repair matches the rest of the wall. 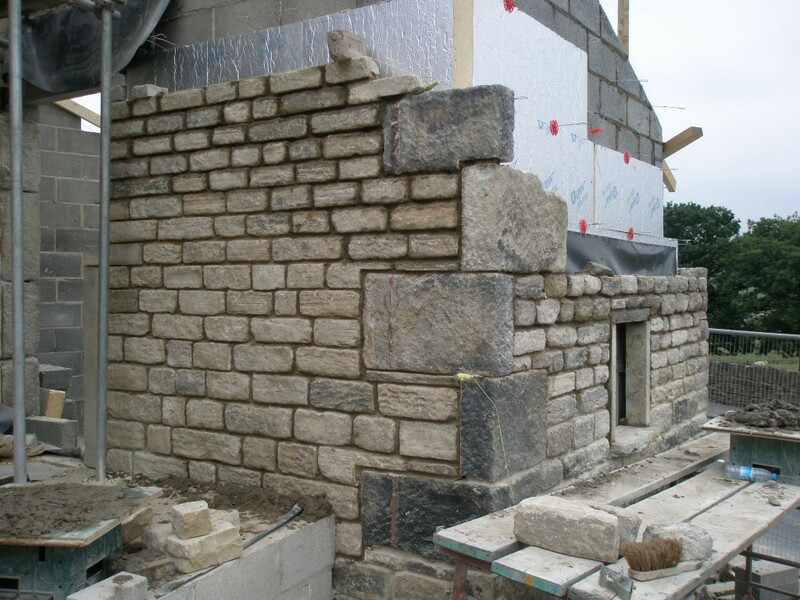 We have been largely successful at achieving this except for some of the coping stones. If I find some black faced coping stones, I might swap these for the ones we installed today. Since the coping stones are the top course, this is easily done. For now, the job is complete. 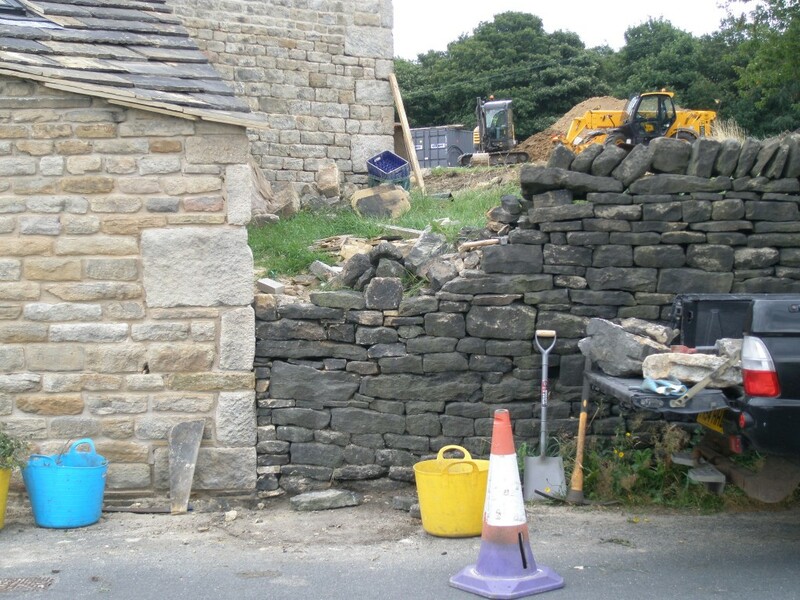 Part of the dry stone wall adjoining the rebuilt extension had to be taken down while it was being rebuilt. Now this corner has been repointed the wall can be rebuilt. First job is to clear the weeds and remove the loose stone. 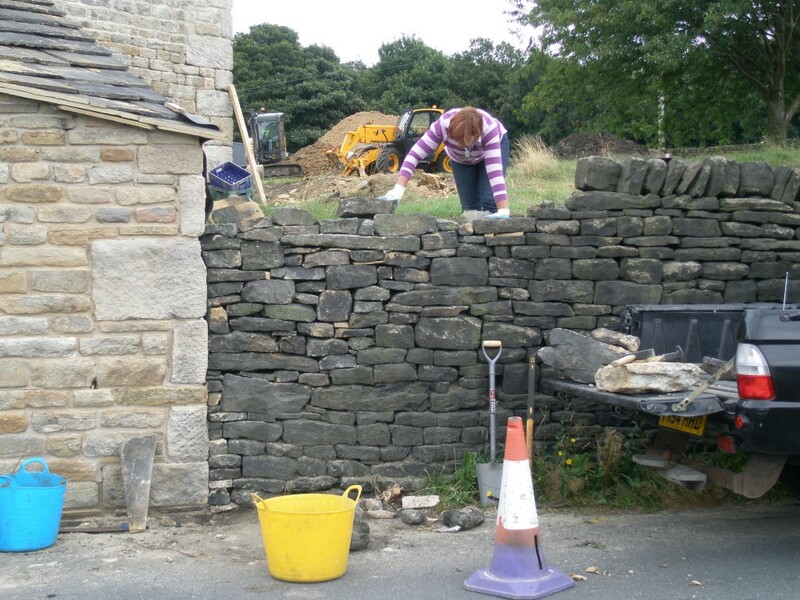 Having cleared the weeds low down, the wall is rebuilt. Avoiding taking too much of it apart. I tend to just dismantle the wall until we reach something solid (and flat). Almost up to the top course and ready for the coping stones. To reach the top course from this side, it is handy to stand on the back of the pickup. Now with the coping stones. It only took a couple of hours to complete. I have been down in London for the past couple of days and it is always great to come back and see the progress on the house. The builders always seem to make more progress when I am not here! I wonder why! Anyway, the roof is finally complete on the rebuilt extension. We were held up for a few days after the wrong size Velux rooflights were delivered. Anyway, the correct ones arrived earlier in the week and the roofers returned to finish off the job they had started. It looks really nice and it very light inside. We have double the size of the window in the wall and increased the size of the rooflight and then put in two instead of one! Much of the window sizing was based on what was there previously (although there was never a rooflight). The problem with this approach is that this part of the building was a coal hole! There was no point in rebuilding it to have a very modern coal hole. It was easier enough to increase the window sizes. Since none of the windows overlook anyone else, or in fact can be seen by anyone, we didn’t need to go back to Planning. When I get some time, I will take some photos from the inside. The roof on the newly re-built extension has been completed. The Velux windows finally arrived a couple of days ago which meant that the roofer could get on and finish the job (despite the rain!). 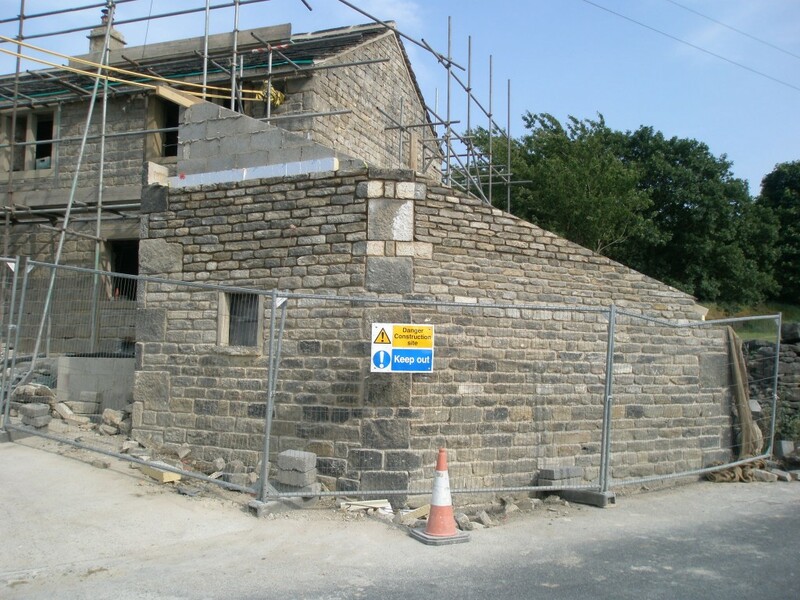 Now the stonework on newly rebuilt extension is complete, we need to get it sandblasted. 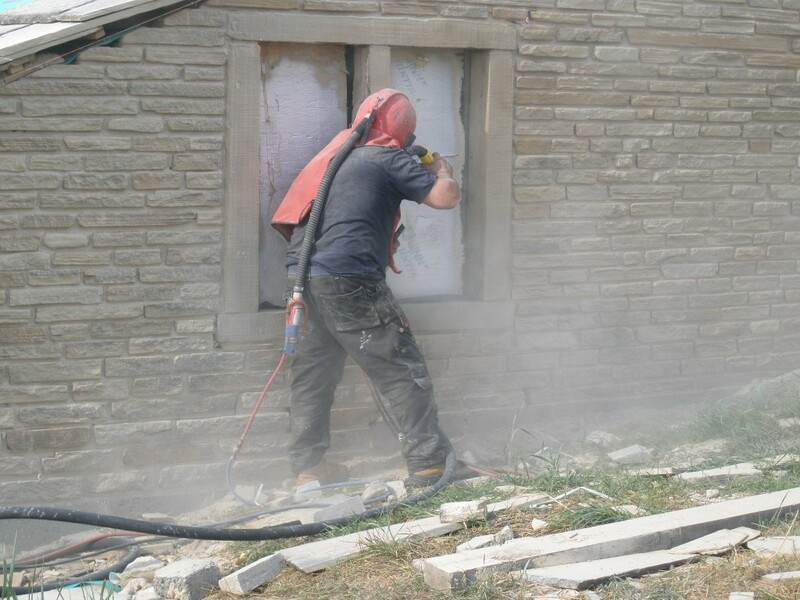 This needs to be done before the new windows are installed on Monday – as part of the sandblasting process we are cleaning the stone window frames removing any signs of the previous windows. As well as sandblasting the new extension, we have also taken the opportunity to remove any marks where the scaffolding had been. Due to the scaffolding poles being so close to the building, there were patches where we couldn’t clean the building until the scaffolding had been removed. 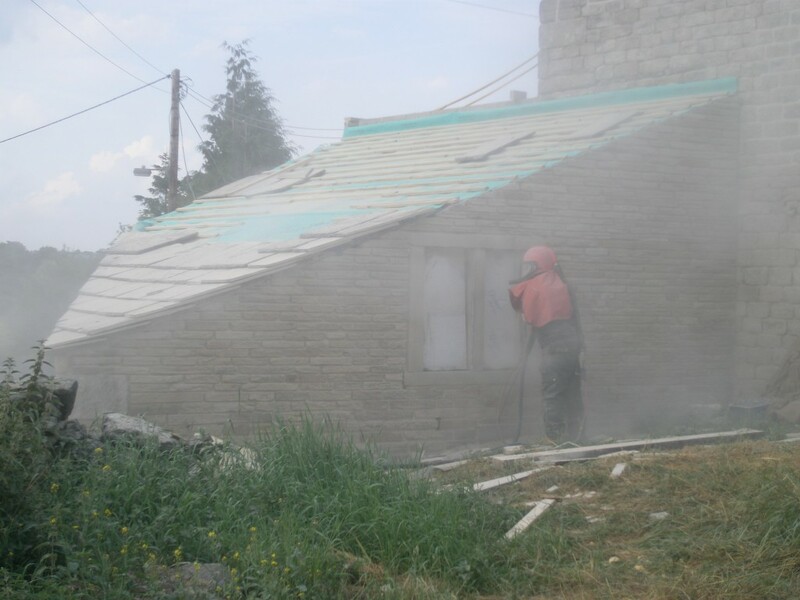 We also sandblasted the old outbuilding. This had some of the darkest stone on site and no longer looked as if it were part of the same set of buildings anymore. This was a long day – from lunchtime through to 8:30pm. I was glad when it was all over. But the end result looks great. 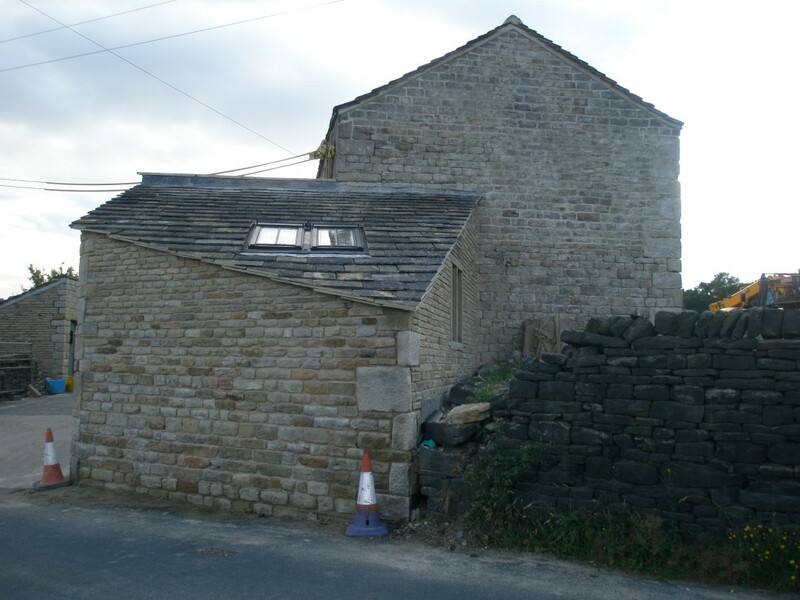 You can see the stonework on the newly rebuilt extension that has been cleaned. We are now giving the outbuildings a clean so that they fit it with the rest of the property. This is a noisy and messy job. Hence doing it on a Saturday afternoon while none of the builders are on site. This ashlar window surround was originally upstairs in the front of the building and we have “repurposed” it for a set of windows in the rebuilt extension. The stone work has already been cleaned, but we are now taking off the remanants of the sealant used for the original windows. The newly rebuilt extension and the outbuildings have been sandblasted to get them to “fit together”. The first door in the outbuilding (the one that is higher than the rest) is the original toilet for the property. This dates back to around the 1700’s. The large green plastic toilet dates back to 2012. 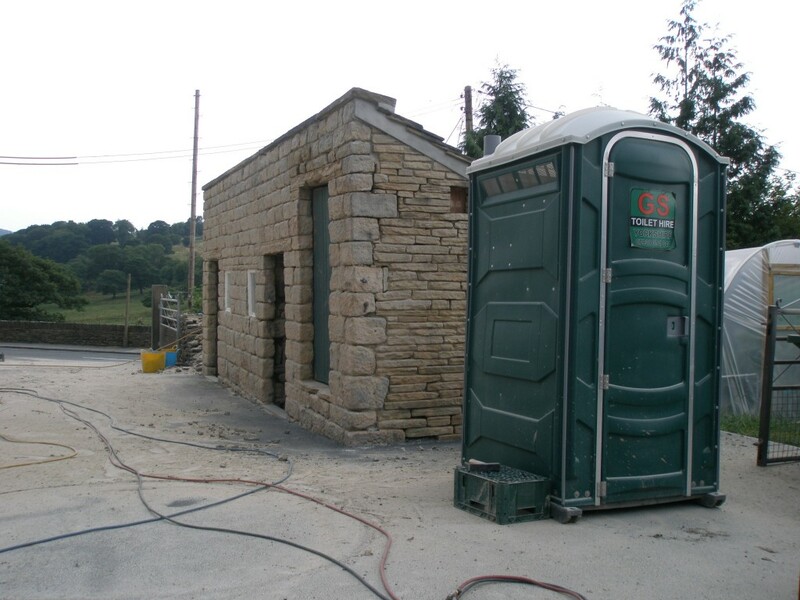 By the way, it is purely coincendental that the green toilet doors – old and new – are the same colour. 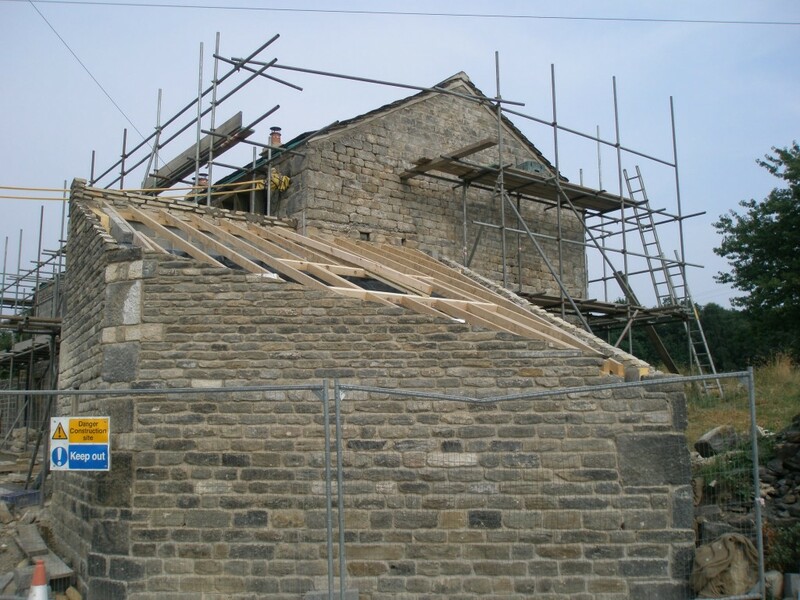 The roofing felt and lathes are now in place on the rebuilt extension. 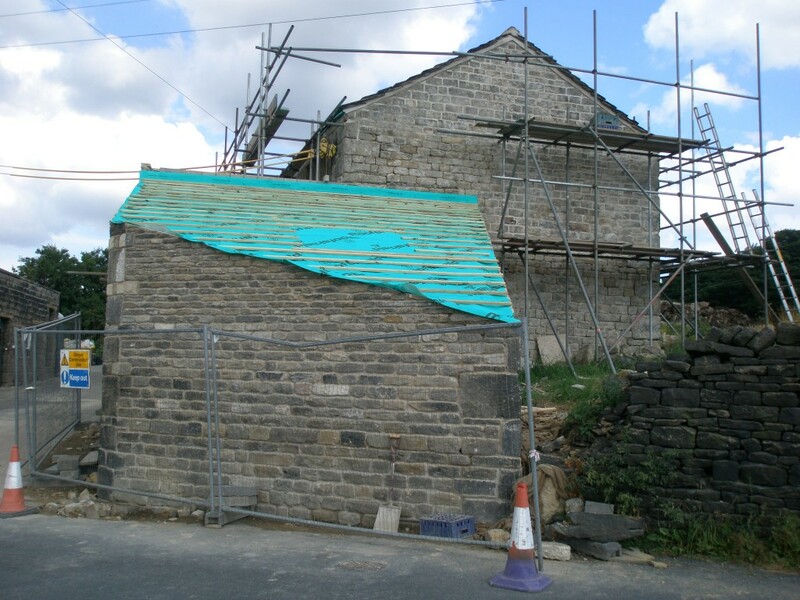 Tomorrow the stone slates will be replaced and with any luck the roof will have been completed by the end of this week. It will make a big difference. 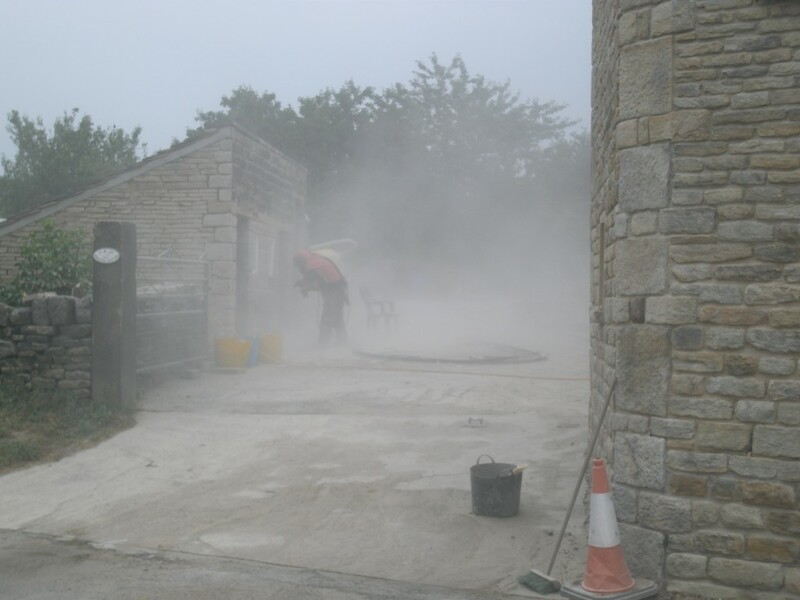 The sandblasting of the extension is planned for the weekend so that we can get on with the pointing of the extension next week. Felted and battened and ready for the stone slates to go back on tomorrow. This should be done by the end of the week. Inside everything has a greenish hue due to the felt on the roof. Looking out of the window in the rebuilt extension. It feels a bit like camping! It has been cooler today than for the last couple of weeks. There is even rain forecast for the next couple of days. 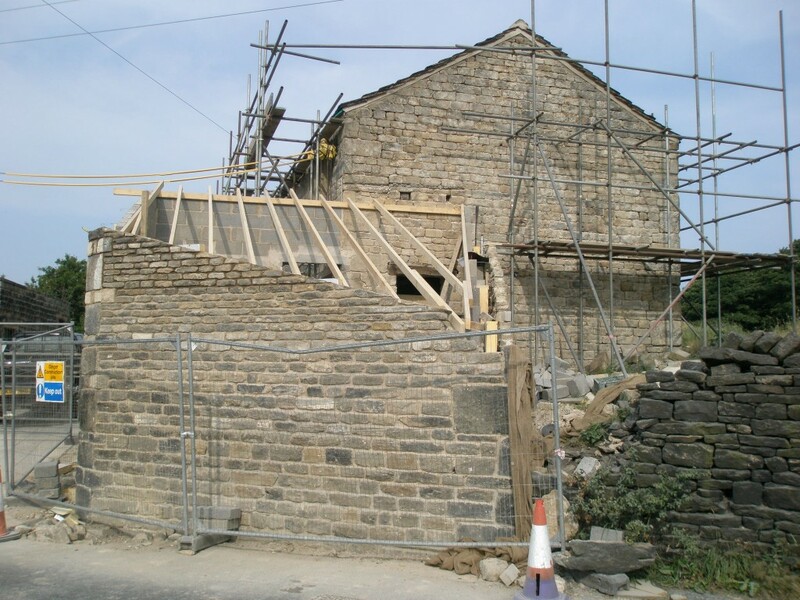 The builders have taken the opportunity to push ahead on the gable end on the main house as well as getting the woodwork ready for the roofers who return on Wednesday. With any luck, the roof will be back on the rebuilt extension by the end of this week. The roof rafters are in and the holes have been cut for the two Velux rooflights. 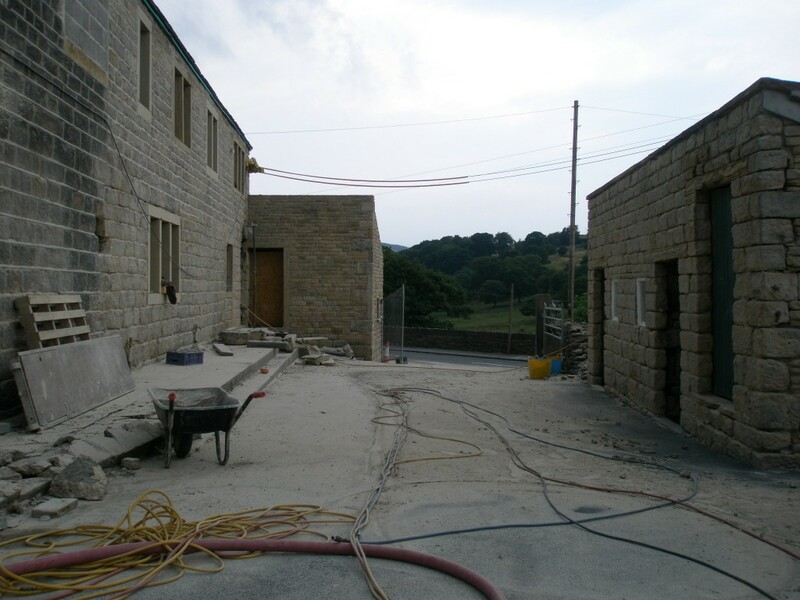 The weather has been cooler today, so we have been able to make a start on repointing the gable end of the main building (in the background). 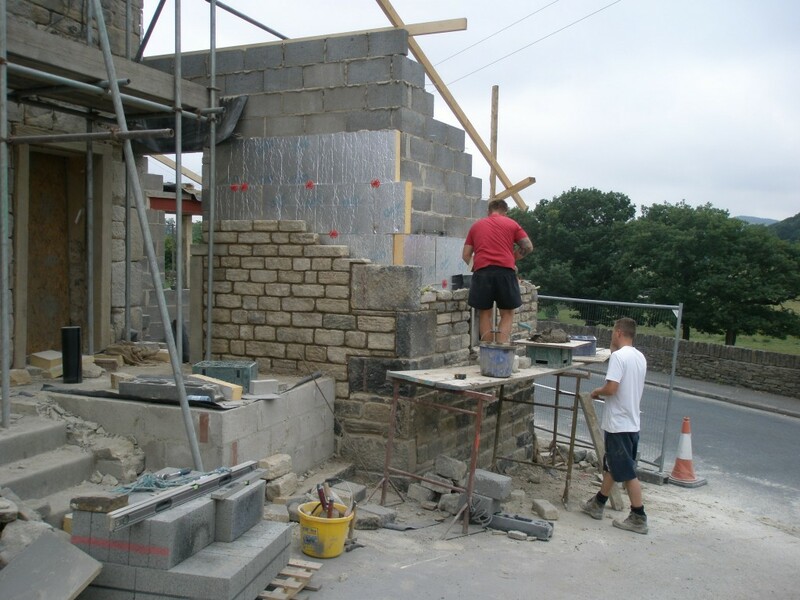 Despite the really hot weather over the last few days, the rebuilding of the extension is going well. 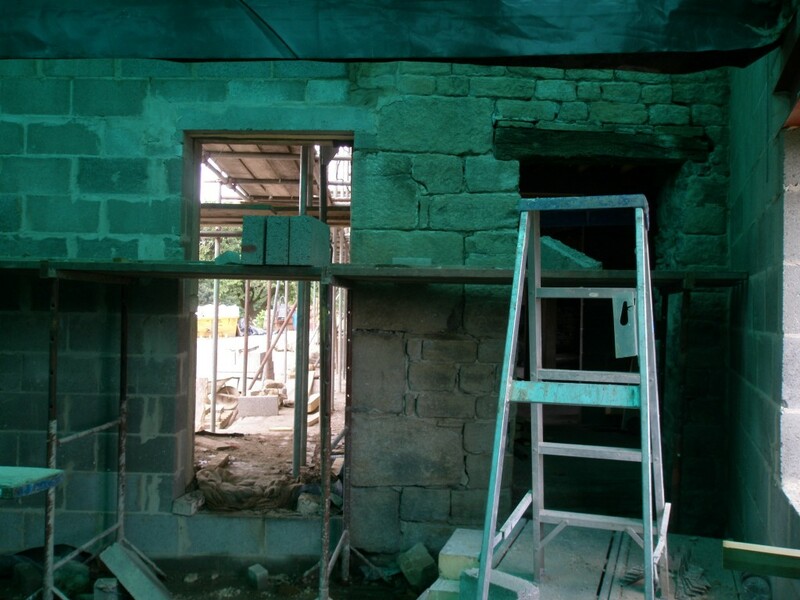 The back of every stone has been cut (using a Stihl saw) to ensure that there is a cavity between the outside wall and the internal insulation. This is a labourious and dusty job. The rafters have now been installed. A large oak beam arrives next week which will support the rafters across the mid-section. This was originally going to be a steel beam that was going to be boxed in and plastered, but given that we haven’t done this anyway else on the property, we have changed this to an oak beam so that it fits in with everything else. 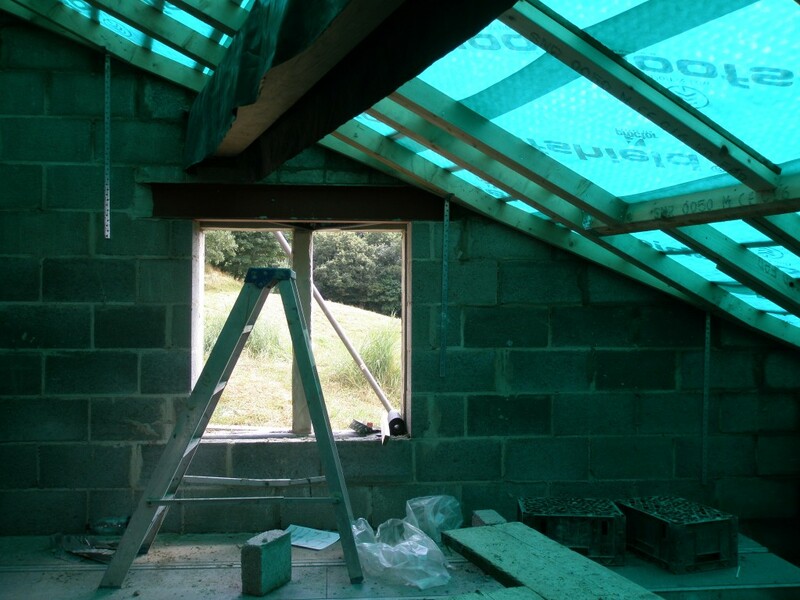 We have also decided to increase the size and number of rooflights in the extension. We have already double the size of the window that looks out onto the bottom field. Originally, this was a coal hole and simply putting back the same size windows would not have supplied enough light – particularly, when you consider how light the rest of the property is. The roadside wall is now up to the right height. 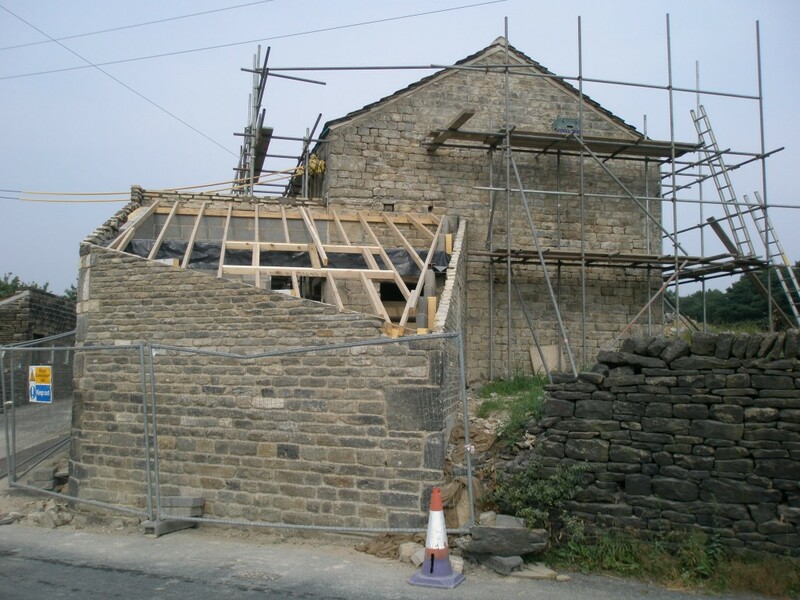 The roadside wall is now full height and the rafters have been installed. All of the original stone has to be cut to ensure that there is a consistently size cavity between the stone work and the insulation. This is a messy and dusty job that isn’t made any more pleasant by searing heat (although it isn’t as hot as it was a couple of days ago. As the courses get higher, they get shorter. 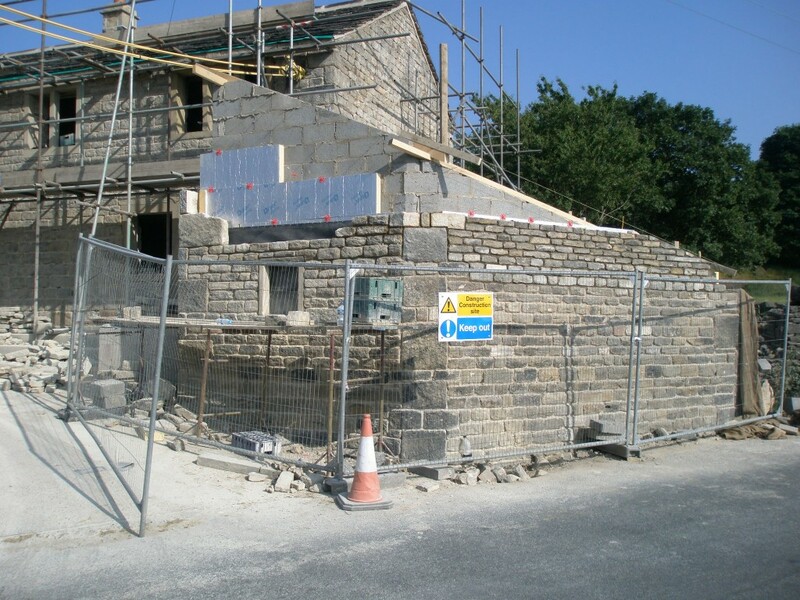 Next couple of days and the stonework will be finished. The rebuilding of the extension is coming on well. The weather yesterday was cooler than the previous day when the temperature hit 31 degrees! All very nice, but just a little to warm to work in. It is also to warm to do any pointing as the lime mortar will dry too quickly in the sun and crack. So the inside jobs we have been keeping in case it rains are now being done because it is too hot to work in the sun! The coal hole has now been re-instated. The intention is that we will use this to hold flowers just as the previous owners had done. This is all part of trying to re-instate the property to its previous configuration. 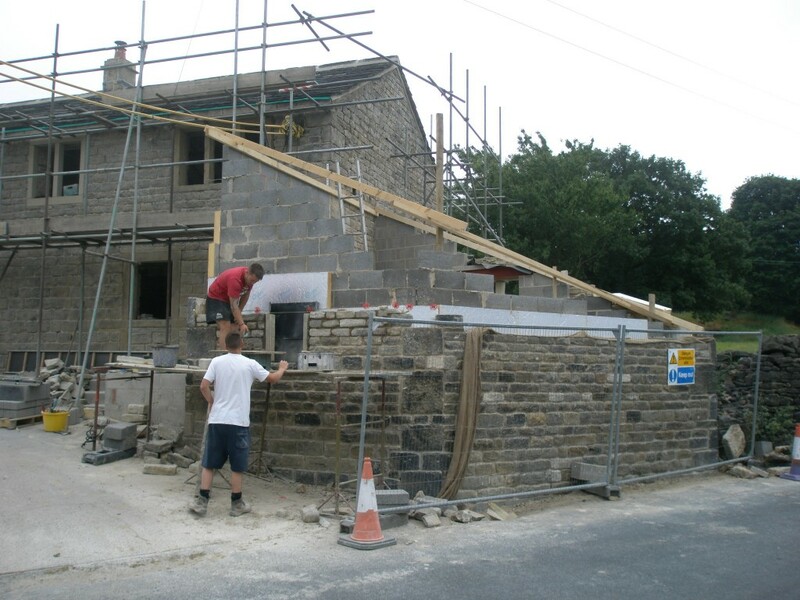 The wall plates for the roof have been put into position so that the walls can be built up to meet it. This is the easiest way of rebuilding the walls in this rather quirky part of the building. The hole for the coal hole is being reinstated to hold flowers.